Most Annoying Audio CD: Who pays to listen to this??? This is Laffy! 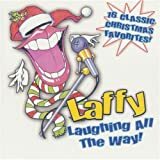 And she Laughs all the way, I haven't ever heard any sound more disturbing and annoying than this, this cd can make your Christmas a nightmare, listen to the mp3 samples, or probably you might wanna buy it!